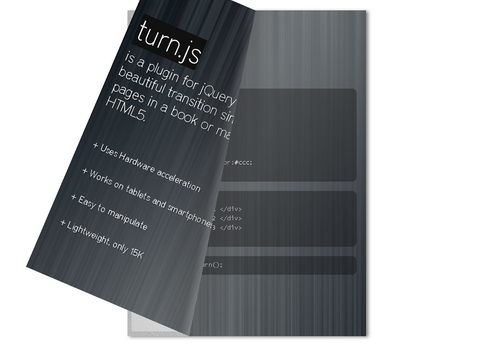 Turn.js is a plugin for jQuery that adds a beautiful transition similar to real pages in a book or magazine with HTML5. It works in all modern browsers including touch devices. And it is easy to manipulate, and lightweight with only 15k. Turn.js is released under MIT License. This is very well done. Good job turnjs team! The first HTML5 page flip with real effects. Great job. This is not a proper MIT license. The developer has abused the principals of the original MIT/BSD licenses, which are to allow commercial or non-commercial use with attribution remaining in the source code. The current license says personal non-commercial use only!